Cindy Dunigan grew up in Claremont, New Hampshire and moved to Vermont after getting her Associates Degree. She finished her Baccalaureate degree at the College of St. Joseph in Rutland (2009) in Organizational Leadership. She has experience as a sign maker, advertising sales representative, and a preschool teacher. She also worked as a para-educator for 15 years at Rutland High School. In her role at the high school, Cindy was able to see first-hand the positive effects of Stafford on many students. As a matter of fact, she encouraged her own child to apply to Stafford. He is now pursuing a degree in Chemistry at Castelton University. 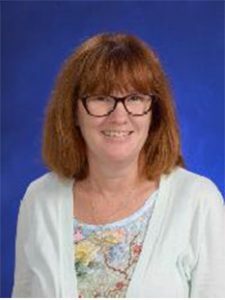 In her role as outreach coordinator, Cindy is responsible for marketing Stafford to the community, working with sending schools and the Regional Advisory Board as well as coordinating the summer camps and working with the after-school program, EPIC. Attending community events is also part of the job, so you never know when you might run into her. When she is not at work Cindy enjoys reading and is an active member of the Union Book Club. When asked what her favorite book is she is apt to answer, “The next one I read.” She also enjoys knitting and is often seen wearing hand knit items. If you happen to see her exploring old cemeteries, ask her about her work with the volunteer organization Find A Grave.